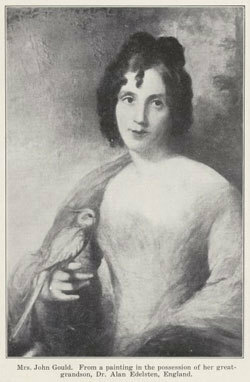 Australian novel, The Birdman's Wife by Melissa Ashley pays homage to English natural history artist, Eliza Gould. 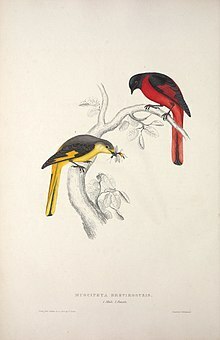 While beginning in England, the book traces Eliza's life from a Governess to her voyage to Australia (between 1838 and 1840), when she accompanied her husband to extend his ornithological studies and where she painted new species. We experience her internal struggle to leave behind the smaller children she loves who are in the care of her family with her desire to explore these new lands to discover unknown bird life. Melissa Ashley presents the character of Eliza as a creative, hard-working, understated, and gifted artist of birds. During 12 years of marriage, Elizabeth was a prolific artist who produced more than 600 lithographic plates, while also raising six surviving children, and circumnavigating the world. The talent and contribution of Ms Gould and her exceptional paintings were often overshadowed by the accomplishments of her notable husband and zoologist, John Gould. Gould was the first curator and preserver at the museum of the Zoological Society of London in 1827. The images inside the cover of the book, which are a sample of Eliza's artwork are vivid and beautiful and reflect her natural, creative talent. They are a special and extra gift to the reader. I found the book at times a little slow moving and the description of killing the birds for scientific discovery a little challenging. However, I appreciated that the book offers a detailed insight into Eliza Goulds' artistic and scientific contribution and Ashleys' dedication for shining a light on the lesser known of the two Goulds. If you are a bird watcher or artist, you will love this one. Melissa Ashley is a writer, poet, birder and academic who tutors in poetry and creative writing at the University of Queensland. She has published a collection of poems, The Hospital for Dolls, short stories, essays and articles. Melissa undertook her PhD dissertation on Elizabeth Gould. She lives in Brisbane with her two children.